Personality: A smart kid, Travis puts his brain to work all the time. Though it proves more helpful than not, he has gotten into trouble by over-thinking a situation - primarily with his coach during swim meets. He is mildly athletic, swimming all year round and for his high school team as well as snowboarding with his friends during the winter when he has free time. Travis is very loyal to his family and friends and would risk his life to save them. Fears: MASSIVELY afraid of snakes, but also dislikes the unknown (and is jumpy in the dark as a result). Dislikes: Disappointing and causing pain to others. He also dislikes the tremendous pressure he is constantly put under by the expectations of those around him. History: The oldest of four children, Travis has a pair of twin sisters that are two years younger than he is and a brother five years younger. His experiences and actions cause others to believe that he is a natural leader and these observations have proven to be true. The past year, he co-led his swim team to the state champions and many expect him to do go again during his coming senior year. He also does his best in school and has shone brightest in his math courses. This skill also allows him to excel in computer programming, a subject he has taken a hobby in and wishes to pursue in his career. Following this new passion, he now does a lot of the software programming for his school's robitics team, although he is unable to attend the competitions due to conflicts with his swimming schedule. Although he has great friends and outstanding achievements, he feels he lacks one thing: his parents' love. He knows that they love him and are proud of his accomplishments, yet they have never been to any of his swimming competitions nor asked to see photos of the robots he has helped design. While his parents are off being at the top of their respective fields - his mom is ranked as one of the best defensive attorneys in the state of Massachusetts and his dad is an accomplished surgeon and frequently flies to other states to assist in difficult procedures - Travis assists their elderly grandmother in caring for his siblings. Although he cares tremendously for his family and friends, he always feels more comfortable when in the peaceful water or working on computers that don't expect much from him. Alright. You did a great job on this application. Very much approved. 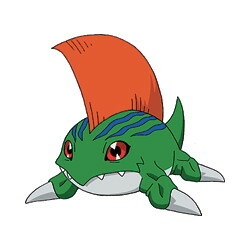 Betamon is an Amphibian Digimon with a gentle and quiet personality. But when he gets angry, his electrical powers shock anyone around him, no matter who they are. Betamon is a rather tempermental digimon. He has good intentions and tries to be helpful, but he is quick to take offense and when he does, the consequences can be painful. His temper can get him into a lot of trouble, but it is also what makes him so dangerous when facing an enemy. Bukamon is the kind of digimon that you definitely want as your friend and not your enemy.